Now that Charlotte has been besieged by a monsoon, being in an ocean-themed restaurant seemed oddly appropriate. Aquavina, Innovative Contemporary Seafood, a 220-seat upscale spot that opened in The Ratcliffe on the Green on Valentine's Day, is restaurateur Stefan Latorre's entry into the refined, yet fickle world of seafood. In addition to Aquavina, Latorre, who has a personal injury and immigration law practice on Central Avenue, owns Latorre's, Latin-American Cuisine, which opened in 1999 downtown. He recently bought that restaurant's adjoining building and plans to open a three-floor dance club later this fall. The best access to Aquavina's second floor location is a brief detour through The Green, a well-designed, humorous urban park that boasts the directional sign indicating that Charlotte is the center of the known world. That's true, you know. Once you enter Aquavina, Latorre's attention to art is evident. The interior is laudable in its approach toward an awkward restaurant space, one that's stretched out along the side of a building. The main dining room, off to the left of the entrance, contains the abstract mural "Sea Urchin" by local artist Boris Tomic. Along another wall is a series of terracotta coral sculptures. Overhead hang three abstract leather on metal "ancient" fishing canoes, ranging in length from 15 to 18 feet long. Latorre, who is also on the board of the McColl Center for the Visual Arts, says the art in Aquavina represents more than 4000 hours of work. Toward the rear of the restaurant is a cheerful yellow room punctuated by street-side windows and highlighted with bamboo overhead. The bamboo shows up again as breadbaskets and towel baskets in the bathroom. A nice touch. Sandwiched in the middle of these rooms is an open blue area which seats 20 and is used for private parties. Aquavina is fronted by a large patio area with a separate bar that overlooks the park. Attention to the visual is carried out in the dish presentations as well. Plates are long or angled, perfect for the dramatic presentations they bear. The menu, which changes seasonally, is dominated by seafood, with a few land animals thrown in. Dishes are dotted with butter, wine reductions, foie gras, dumplings, and fresh produce. Jason Pound is Executive Chef at both Aquavina and Latorre's. According to Latorre he wanted a place to serve dishes that in no way you could do at home. "Either you don't have the ability or tools to make the dishes," he says. "Here Jason can go at it, using very good products, creating some of the things he has really wanted to do," he adds. Pound has been the Executive Chef at Latorre's since 1999. Prior to this, he had been the Sous Chef at Mimosa Grille and in the culinary program at CPCC. Pound seems to take a contrapuntal approach to seafood, taking the basic food element and adding a counter-balancing weight. At times the result is successful. At other times, not. 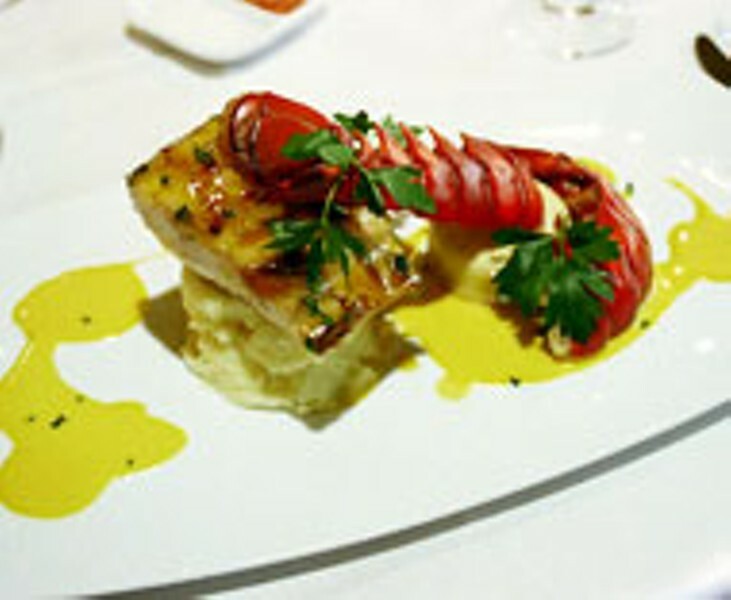 The grilled Mahi and lobster tail entree, for example, is superbly enhanced by a mango butter sauce. Yet the arctic char, with its sliced fingerling potatoes and halved sweet cherry tomatoes, is assaulted by a sauce that's too sweet. Some of the best aquatic treats are among the starters. The hefty portion of bright tasting North Carolina Clams is wonderfully delicious, while the silken corn bisque is accentuated by lobster cream. Our table fought over the anchovy and brioche bread pudding crouton on the Caesar salad. Pound's kitchen stumbles over some delicate feats of equilibrium, especially in pasta that seemed densely undercooked. The lobster dumpling in the corn bisque was gummy, as were the sausage pierogies with the clams. The toast points on another dish were overcooked. Meyer lemon creme brulee, with its too sweet blueberry compote, was itself well crafted, but was also $8, a bit steep for a custard dessert. In fact, during this era of glum fiscal restraint, the prices at Aquavina are wildly optimistic. Most appetizers are $10 to $12, and even with Latorre's pronouncement that the best costs more (we know that, but can we afford that? ), four of the entrees are in the $30's with a $37 price tag for the 10-ounce bone-in Prime Filet Mignon, and $36 for their Surf and Turf rendition. Is this a sign that the bull market will return in the near future and sunny days lie ahead in Charlotte?